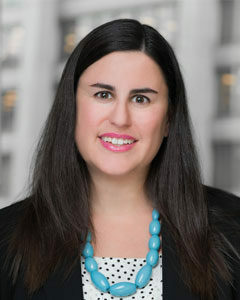 Rachel S. Stern is a partner concentrating her practice in the area of medical malpractice defense, representing physicians, nurses, and hospitals in complex litigation. Representing clients in a wide range of medical fields including emergency medicine, obstetrics/gynecology, orthopedics, anesthesiology, neurosurgery, and wound care, her focus is to obtain efficient and favorable outcomes for clients, with most cases resolved through dismissal, summary adjudication, or favorable settlement. She has successfully defended both hospital and physician clients to verdict at trial in both Lake and Cook Counties. Ms. Stern has also prepared and successfully argued motions to dismiss and summary judgment motions on behalf of her clients, as well as defended numerous nurses and physicians at deposition. Ms. Stern received her J.D. from Chicago-Kent College of Law in 2008 with a certificate in Litigation and Alternative Dispute Resolution. While at Chicago-Kent College of Law, she was the recipient of the CALI Award for Excellence in Legal Writing, Evidence, and Pretrial Litigation, and a member of the Order of the Coif Honor Society. She also served as a judicial extern for the Honorable George W. Lindberg, Northern District of Illinois. Ms. Stern received her bachelor’s degree in History and Spanish from Northwestern University in 2005.